Closed December 2015. Bought privately 2016. Alston Hall former College is about 6 miles east of the border of Preston with easy access to the M6. It held residential and day courses mainly art, craft, pottery, music, nature, astronomy and local history sort of thing. It obtained a Wedding License and updated its accommodation for business conferences and to offer tourist accommodation before it closed. It is set in a very attractive location overlooking the Ribble Valley and is quite isolated from traffic although not far from Junction 31a of the M6. It's a very homely place, nicely decorated and very clean. At peace with the world except that in its final years it was eternally worried about where its finance was coming from. 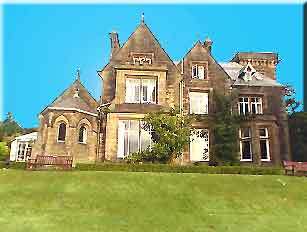 Alston Hall was designed by the architect Alfred Darbyshire and built in 1876 for John Mercer colliery owner. It was originally a Victorian house but was purchased by Preston Council in 1949 and became a teachers training college for a while. It then became a College of Further Education. There is a sad story related to its first Principal who was killed in a road accident near the college only a few months after marrying in 1966, his wife, who was deputy became the next Principal and was, it seems, revered and has just died herself a had a large obituary (September 2007). Lancashire County Council bought it and used it for residential counrse from 1974 until recently. A day course there was a very pleasant experience especially if the weather is kind and you could wander round the gardens and enjoy the lush view across the Ribble Valley. There were always a lot of good cakes and biscuits freely available at breaks. The meals which were very good. There was also a bar, and bedrooms for residential courses or to stay for a break. We went on an astronomy course several years ago that was very interesting as there are large telescopes and a planetarium and it's very dark round there. A group called the Friends of Alston Hall put out a newsletter and had events, talks and working parties. In 2016 it was purchased for use as a house. In March 2017 there was a fire which affected a large part of the building.